Canadians for Justice and Peace in the Middle East (CJPME) opposes US President Donald Trump’s decision to cease all funding to the UN aid agency for Palestinian Refugees (UNRWA). The Trump administration declared Friday that it was cutting all funding to UNRWA, calling the organization an “irredeemably flawed operation,” and seeking to reduce the number of Palestinians recognized as “refugees” under the UN system. Nevertheless, CJPME points out that it is the UN which defines which individuals are considered refugees, and that UNRWA adheres to international norms in defining the population of Palestinian refugees that it serves. 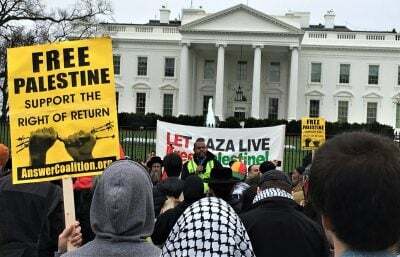 “This is a sad ploy by Trump to further disempower Palestinians, to the political advantage of the US’ ally Israel,” declared Thomas Woodley, president of CJPME. It is extremely unlikely that the UN would suddenly revamp its definition of what constitutes a refugee just to suit the Trump administration’s agenda on Israel-Palestine. CJPME notes that the world has addressed refugee crises for decades according to fair and humanitarian principles, and has successfully resolved dozens of refugee crises. “Canada must follow the example of Germany and Japan, and commit to greater funding to UNRWA to offset the US decision,” asserts Woodley. Canada’s current funding constitutes less than 2% of UNWRA’s overall funds. Canada, as gavel-holder for the Refugee Working Group, should also step in to fill the gap left by the US’ dearth of legitimate leadership on the issue.